FREDERIC AUGUSTE BARTHOLDI was born at Colmar, in Alsace, France, on April 2, 1834. 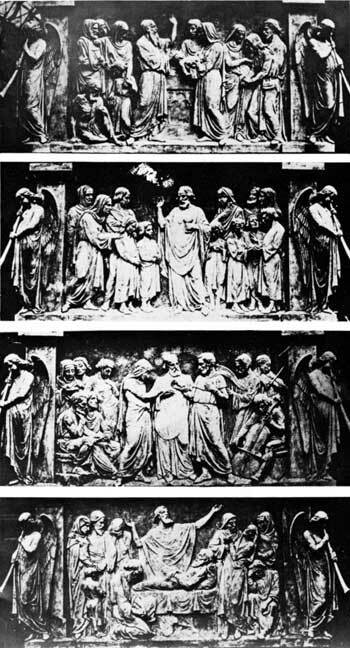 At first he studied painting under Ary Scheffer, the famous Parisian society portraitist, but soon abandoned it for sculpture under the influence of the Parisian, Jean Francois Soitoux, working on a colossal scale and with architectural effects. When Bartholdi was 20 years old he traveled in Egypt and studied Egyptian art. This had a noticeable effect upon his taste for sculpture of the broad and decorative type. Bartholdi made a second trip to Egypt in 1868. He was further impressed by the ruins and colossal monuments which he saw and the principles which had controlled their conception. At the outbreak of the Franco-Prussian War of 1870-71, Bartholdi obtained a commission from the Government to go to Colmar to organize the National Guard. After the completion of this assignment he went to Tours and placed himself under the orders of the Government of National Defense. Although Bartholdi's name would have been known for the work he had done prior to the Franco-Prussian War, the effects of that war upon his country, and the loss of the city of his birth, fired him with a deep feeling of nationalism. That influence was reflected in his work and won for him greater acclaim. It was after the war that Bartholdi traveled to America. Both the aim and result of that trip are well known. The story of Bartholdi's life for many years thereafter is the story of the building of the Statue of Liberty, one of his best works and the one by which he wished to be remembered. The Lion of Belfort, by Bartholdi. 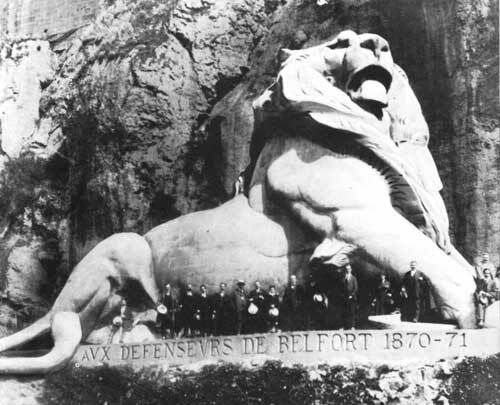 Another of Bartholdi's works, The Lion of Belfort, at Belfort, France, is also a lasting monument to his fame. This colossal lion, carved in the side of a mountain, recalls the gigantic struggle where the French held off the Prussian assault until the end of the Franco-Prussian War. In addition to the Statue of Liberty, there are other works of Bartholdi in Americathe Bartholdi Fountain in the Botanic Garden, Washington, D. C.; the four angelic trumpeters on the four corners of the tower of the First Baptist Church, Boston, Mass. ; and the Lafayette Statue, in Union Square, and the Lafayette and Washington Monument, at Morningside Park, both in New York City. Frederic Auguste Bartholdi died of tuberculosis in Paris on October 4, 1904. Four Angelic Trumpeters, by Bartholdi, on First Baptist Church, Boston.